Photo of a chocolate cake on a dish with berries and red glaze drizzles. 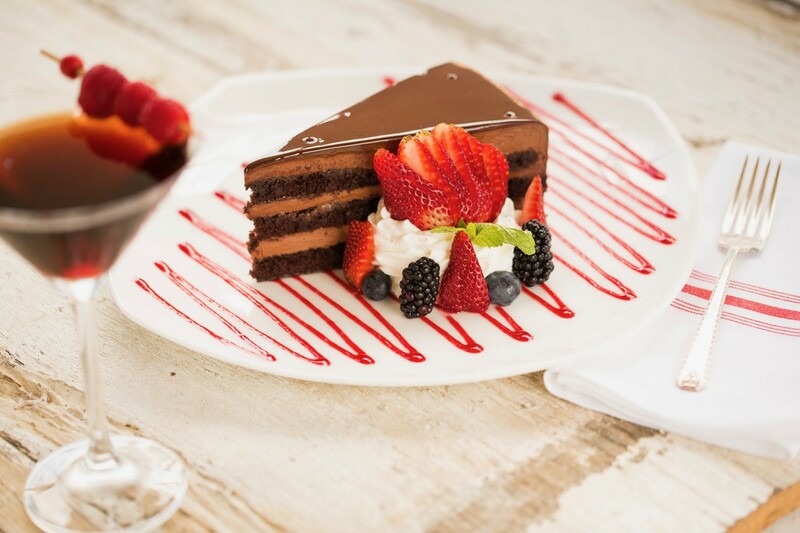 This multi-layer chocolate cake is a dessert option on B&B Butcher's Valentine's Day menu. Photo courtesy of B&B Butchers. A day that is both loved and detested is upon us: Valentine’s Day. It’s the holiday where you show your love for your significant other with a dozen roses, chocolates and fine Champagne. Or, maybe you’re that guy who went to Jared, that jewelry store that’s constantly running guilt-inducing commercials. (Good on you, Jared-Going Guy!) It’s also the day where the lonely curse happy couples and those Guys Who Went To Jared. No matter what Valentine’s Day means to you, though, you still have to eat. This curated list of our top picks for Valentine’s Day include the most fun, romantic and clever dining deals. Celebrate love in whatever form strikes you, whether you’ve been married for 40 years, are out with your best gal pals for “Galentine’s Day” or are wide-eyed over the fact that he did, indeed, go to Jared. Eat, drink and be merry on this heart’s day. Because, as Lin-Manuel Miranda so eloquently put it, love is love is love is love is love is love is love is love. B&B Butchers, 1814 Washington: Valentine’s Day dinner begins with complimentary chocolate-dipped strawberries. Augmentations to the regular a la carte menu include a seared foie gras appetizer for $16; a mini surf-and-turf entree of a five to six-ounce lobster tail and 10-ounce filet for $69; and a red velvet cake for $9. Guests can also preorder flowers and a box of specialty chocolates to be on their table upon arrival at the restaurant. Call 24 hours in advance to request. Reservations are highly recommended. The dinner options are available from February 8 through February 14. Bistro Menil, 1315 West Alabama: Chef Greg Martin’s Valentine’s Day menu is three courses and available through February 18. The dishes are shrimp bisque with crab toast appetizer, roasted fillet of beef with a tarragon-butter poached lobster tail and coeur à la crème with raspberry sauce for dessert. The cost for the meal, which includes an amuse bouche, is $64 per person plus gratuity. Each of the Valentine’s Day items may also be purchased on the restaurant’s a la carte menu. There’s also a new cocktail for Valentine’s Day: the Menil Royale, a combination of Ayala champagne, raspberry port and fresh raspberry purée. Cadillac Bar, 1802 Shepherd and #7 Kemah Boardwalk: Diners seeking a more laid-back approach to Valentine’s Day dining will enjoy this Southwest-inspired spot’s three-course menu. Choose from chicken tamales or chicken queso to share, then select two entrées from grilled mahi mahi, steak enchiladas or chicken and shrimp fajitas. For dessert, share a chipotle raspberry chocolate cake or mango pie. The cost is $49.99 per couple and the menu is available between February 13 and 17. For reservations at the Shepherd location, call (713) 862-2020; for Kemah, call (281) 334-9049. 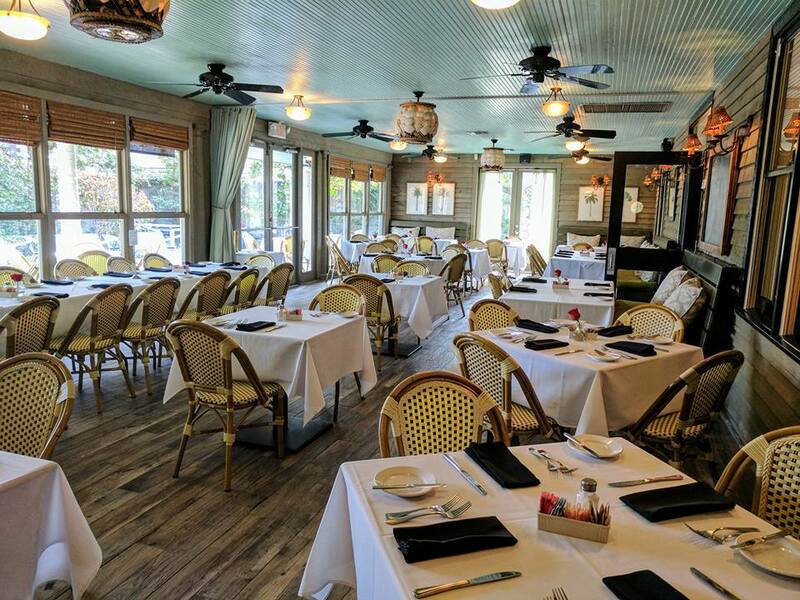 Chez Nous is a fine French restaurant for romantic dining, located on the northeast side of Houston in Humble. Photo courtesy of Chez Nous. Chez Nous, 217 Avenue G, Humble: Chef Stacy Crowe-Simonson made her three-course Valentine’s Day menu theme “A Culinary Poem.” It includes flirting (appetizers), kissing (entrees) and sweet dreams (desserts). Menu selections include Tartin de Foie Gras, a Napoleon of toasted brioche, seared foie gras, and Calvados apple brandy; Veal Orloff, veal topped with mushroom duxelle, Gruyere cheese and Bordelaise sauce; pan-seared diver scallops; and Gâteau Saint Honoré, a candied puff pastry filled with dark chocolate pastry cream and topped with caramelized profiteroles and fresh strawberries. The cost is $85 per person, excluding tax, gratuity and beverages. Seatings are available between 5 and 5:30 p.m. or 9 and 9:30 p.m. Reservations are a must. Call (281) 446-6717. Seared scallops with foie gras is one of the options available at CRÚ Food and Wine Bar. Photo courtesy CRÚ Food and Wine Bar. 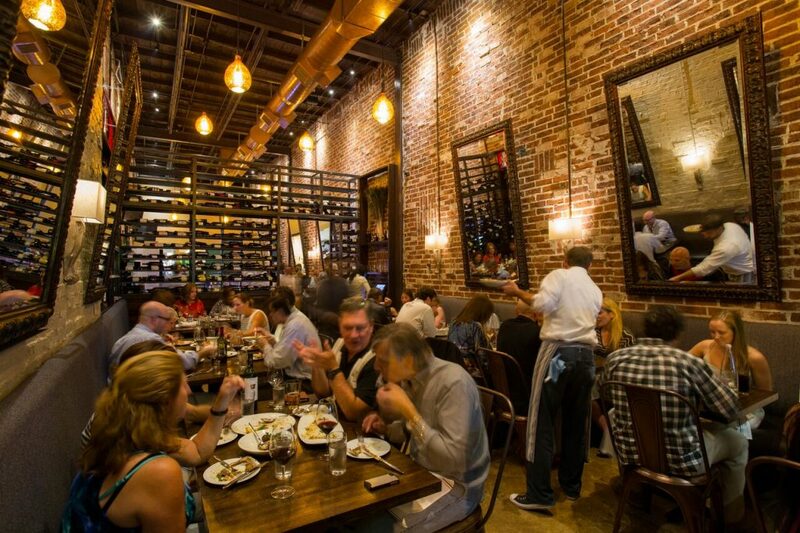 CRÚ Food and Wine Bar, 2800 Kirby and 9595 Six Pines, The Woodlands: “Great chefs we love” is the theme behind the romantic Valentine’s Day menu at the trendy wine bar. The restaurant’s chefs have crafted a four-course menu with selections that are homages to their favorite chefs. 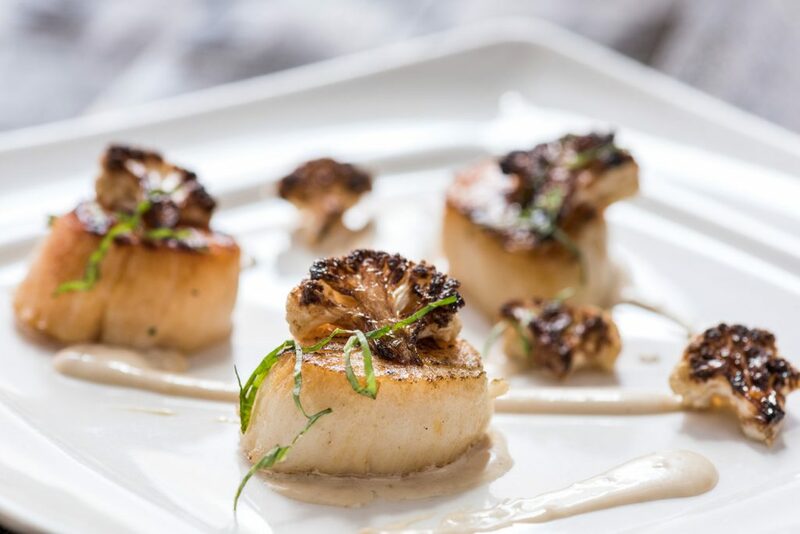 Selections include seared scallops with foie gras, a nod to Jean-Georges Vongerichten; a baked goat cheese salad that honors Alice Waters; potato and leek soup in salute to Julia Child and an apple and pear tarte tatin from Jacques Pepin. The cost is $55 per person and the special menu is available only on February 14. The downstairs Bar at El Big Bad. Photo courtesy of El Big Bad. El Big Bad, 419 Travis: The downtown spot revives its “I love you and tacos so much” Valentine’s Day event that was popular last year. It’s a budget-friendly, taco-laden dining opportunity. For just under $40, couples can have all-they-can-eat tacos with a choices of chicken, beef or pork as well as two margaritas alongside. As a bonus, guests can take their photos against Kevin Hernandez’s 56-foot mural outside El Big Bad that reads, “I love you and tacos so much.” The “bottomless” taco extravaganza is available only on February 14. 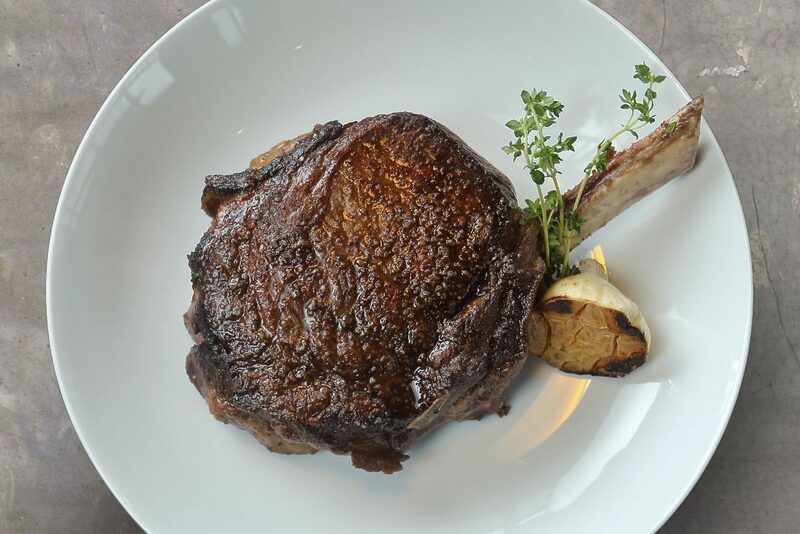 Beef up Valentine’s Day at the “Picnic on the Patio” at FM Kitchen and Bar with this 30-ounce ribeye. Photo courtesy FM Kitchen and Bar. FM Kitchen and Bar, 1112 Shepherd: Chef Ryan Hildebrand’s menu reflects this watering hole’s laid-back vibe combined artisan food. His “Picnic on the Patio” is a three-course affair that includes four splits of Champagne (diner’s choice of rosé or brut). There’s a shared appetizer of roasted beet and watermelon salad; a choice of bone-in pork loin with mushroom whiskey cream, roasted chicken or a 30-ounce bone-in ribeye; and a shared dessert of chocolate and fig bread pudding. The cost is $88 per couple. (The 30-ounce ribeye is $28 extra.) The menu is available on February 14. 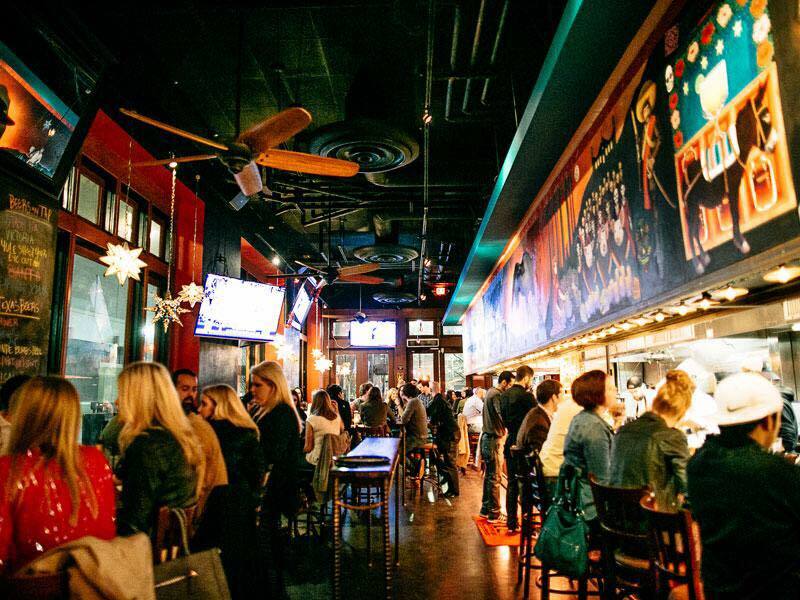 Adding to the party atmosphere, VODI, a local acoustic band, will perform from 6:30 to 8:30 p.m.
Harold’s Restaurant Bar and Terrace, 350 West 19th: The kicked-up Creole cuisine has made this Heights spot a favorite. Valentine’s Day dining starts with boudin balls, and gives guests a choice of appetizers, entrées and desserts including Creole gumbo; barbeque shrimp toast; crispy oysters; a 44 Farms steak with mashed potatoes and roasted vegetables; a chocolate and strawberry cupcake with a molten center; and a Meyer lemon tart. The four-course dinner costs $65 per person, excluding tax and gratuity. Diners can opt for a $25 add-on that includes cocktails. Reservations are recommended and must be secured with a valid credit card. Any cancellations must be made prior to 24 hours of the reservation to avoid a $25 fee. Call (713) 360-6204 or reserve online. Hearsay Gastro Lounge, 218 Travis and Hearsay on the Green, 1515 Dallas: Both locations are offering a four-course prix fixe menu for $55 per person. For appetizers, diners can choose between calamari and cheesesteak egg rolls, lobster bisque or an iceberg wedge salad. For the second course, the choices are an eight-ounce filet or Atlantic salmon. Dessert is chocolate-covered strawberries. Also on the menu are special Valentine’s Day cocktails, including Under the Cherry Moon, made with Godiva chocolate liqueur, vanilla vodka and luxardo cherry. The menu is available between February 9 and February 14. S’agapo means I love you in Greek. A special, four-course plated menu is available at Helen Green Food and Wine and Helen in the Heights on February 14. Photo courtesy Helen Greek Food and Wine. Helen Greek Food and Wine, 2429 Rice and Helen In The Heights, 1111 Studewood: Both locations of this Gulf Coast-Meets-Greek concept will offer a four-course menu for $75 per person, with an optional $40 wine pairing. Choose among options such as octopus terrine with Retsina-roasted peppers; potato garlic sauce and Santorini caper leaves; short ribs of beef done in red wine and tomato; and Greek doughnuts tossed in fennel sugar and drizzled with honey syrup. Reservations are a must and can be secured by calling (832) 831-7133 for Helen Greek Food and Wine or (832) 582-7146 for Helen In The Heights. Seating starts at 5 p.m.
Izakaya, 318 Gray: This casual Japanese restaurant caters to two different Valentine’s Day crowds — lovers looking for a cozy dinner spot as well as friends who want an anti-Valentine’s Day celebration. The anti-Valentine’s Day party boasts a candy “bar,” photo booth and drink specials. It takes place in Izakaya’s back dining room. There’s no cover, no set menu and it’s available only during dinner service. 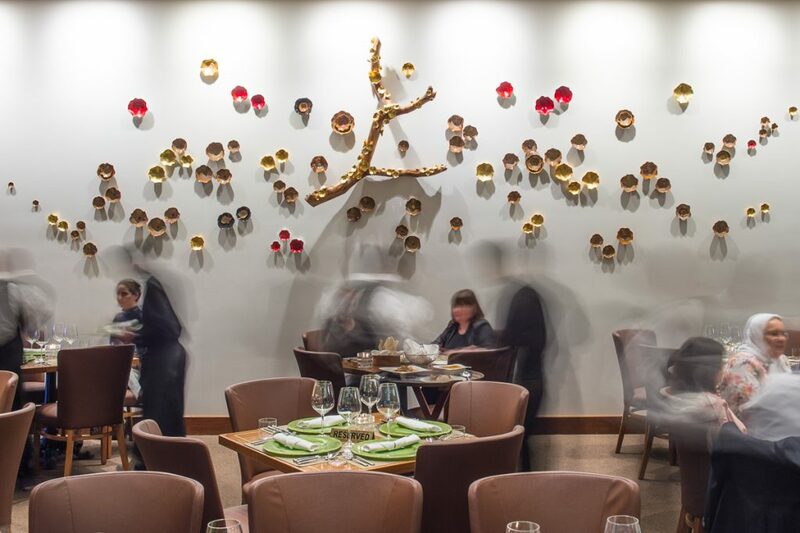 Regular dinner service will be in the front dining room and includes a number of a la carte selections. Reservations are recommended for dinner but not needed for the party. To make a dinner reservation, call (713) 527-8988. Valentine’s Day offerings for carnivores and vegetarians are available at Kiran’s. Photo by Chuck Cook Photography. Kiran’s 2925 Richmond: Chef Kiran Verma’s classy Indian restaurant features two four-course menus on Valentine’s Day with options for carnivores and vegetarians alike. Each is $95 per person. Selections include wheatberry tabbouleh, pomegranate Asian pears, kumquats, roasted lemons and herb vinaigrette; black truffle Guinea hen and a chocolate and raspberry torte. The menu is available on February 14 and two seatings are available, at 5 and 7:30 p.m. For reservations, call (713) 960-8472 or email the restaurant. Lucienne, 1070 Dallas: Chef Jose Hernandez has created a three-course menu for Valentine’s Day with selections that include morel mushroom consummé; sea bream with spring peas and potato; veal chop with butternut squash; and his-and-hers desserts featuring fresh raspberries and cream with crispy meringue and milk chocolate mousse with cherry glaze. The cost is $85 per person, plus tax and gratuity. Dinner will be served from 5:30 to 10:30 p.m. and reservations are required. Call (713) 242-8555. Lucille’s, 5512 La Branch: There’s a three-course menu available in the downstairs dining room that costs $75 per person with selections such as grilled oysters, Texas Wagyu beef and croissant bread pudding. But, upstairs, chef and owner Chris Williams has crafted a “Dinner in the French Quarter.” The white tablecloth service features the same menu options as downstairs and also includes a glass of Champagne to begin the evening, wine pairings with the first and second courses, a special after-dinner cocktail with Cafe Du Monde coffee and a small take-home floral arrangement. The New Orleans-inspired evening feature festive décor and a saxophone player. The cost is $125 per person and reservations for either upstairs or downstairs may be made by calling (713) 568-2505.
three different side dishes and three different sauces and dark chocolate and rose water semifreddo. The cost is $60 per person, excluding tax and gratuity. In addition, all couples will be served a complimentary glass of Prosecco. Hey, that’s amore! To make a reservation, call (832) 328-5151. Diners who like DIY can create their own s’mores at Momo’s this Valentine’s Day. Photo courtesy of Momo’s Wood + Fire. Momo Food + Wine, 4104 Fannin: This Midtown restaurant offers its regular menu on Valentine’s Day, with a sweet addition — Gourmet S’mores. 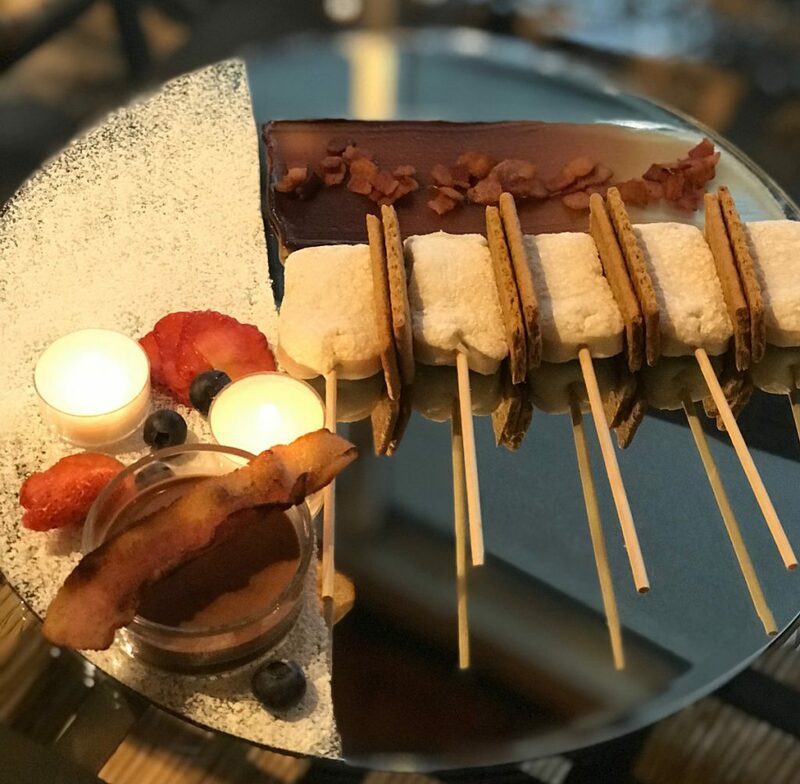 The options provides everything needed for two people to create their own s’mores, including homemade bourbon marshmallows, bacon and more. The DIY platter and two glasses of wine costs $45 and guests can make reservations by calling (832) 582.6335 or via email. Moxie’s Grill and Bar, 5000 Westheimer: The new Galleria area spot offers a three-course prix fixe dinner menu for two this Valentine’s Day. Guests can choose such dishes as Calamari with tempura shrimp, sriracha aioli, sweet chili sauce, a Chipotle mango chicken, New York strip and Moxie’s signature brownie, warm chocolate sauce, vanilla bean ice cream and whipped cream. The cost is $69 a couple. 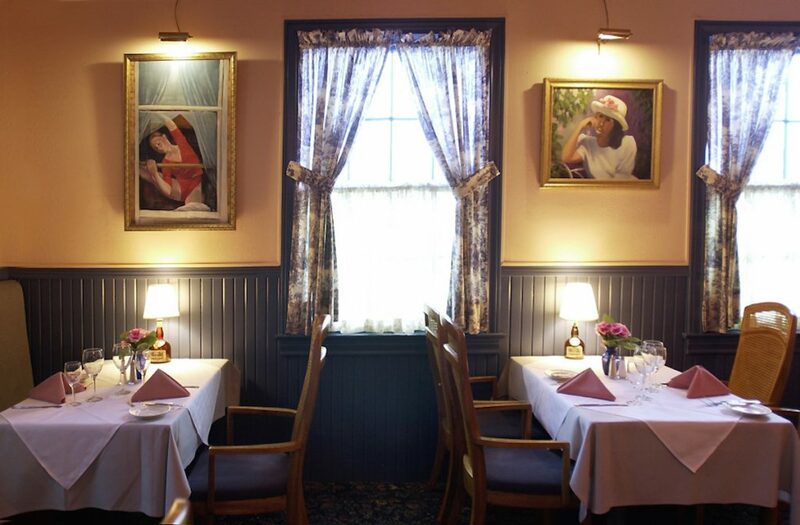 Seating at Ouisie’s Table includes homey rooms and a charming garden area. Photo by Spike Johnson. Ouisie’s Table, 3939 San Felipe: This River Oaks grande dame is a one-stop shop for Valentine’s Day. In addition to an expanded a la carte menu, it will also provide flowers, chocolate and Champagne on the table for an additional charge. To make the magic happen, guests must arrange for the goodies 48 hours in advance. Two long-stemmed red roses are $25, a full dozen costs $90 and anything in between will be priced on a case-by-case basis. Ouisie’s housemade truffles are $12 for six and a bottle of Piper Heidsieck Champagne is $55 per bottle. Reservations are a must for dinner and diners should make them at least 48 hours in advance. Call (713) 528-2264 or email the restaurant. The outside balcony at Rainbow Lodge, which overlooks the patio. Photo Courtesy Rainbow Lodge. 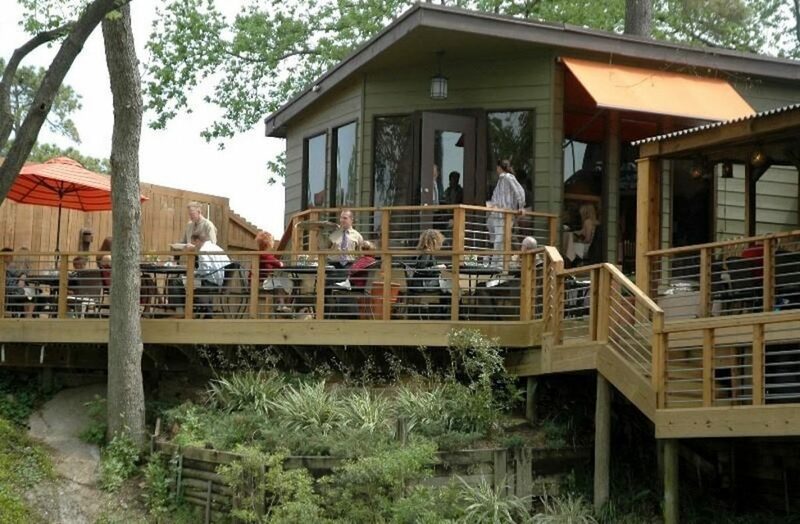 Rainbow Lodge, 2011 Ella: With its focus on seafood and wild game, and its setting in a 113-year-old log cabin, this Shady Acres stalwart routinely tops lists as one of the most romantic restaurants in Houston. On Valentine’s Day, Chef Mark Schmidt’s special four-course menu that starts with a complimentary glass of Champagne selected by beverage director Marc Borel. The many selections include thinly sliced tenderloin with tuna tartar; anchovy aioli and fried capers; truffled sunchoke veloute served with pickled chard and toasted almonds; southern-fried Texas quail bites and white cheddar organic grits; roasted pear and Gorgonzola salad; pan-roasted breast of pheasant; roasted Gulf red snapper with jumbo lump crab and a lemon icebox pie with port wine-mascerated blueberries. The cost is $89 per person plus tax, gratuity and beverages. Seating times are between 5 and 10 p.m. and reservations are highly recommended. To make one, call (713) 861-8666. State of Grace, 3258 Westheimer: This Upper Kirby favorite blends Texas cuisine with high-end service, and its Valentine’s Day menu mirrors that marriage. Guests start the evening with “Biscuits and Ham and Jam” and diners can opt for caviar to go with it for an additional $95. Selections from the four-course menu include tuna carpaccio, hearth roasted bone marrow with a foie gras terrine and smoked onion marmalade, Berkshire pork cheeks with a Huitlacoche tamale and blistered shishito peppers, petit filet mignon with butter poached lobster, and a raspberry pink velvet cake with cream cheese frosting. The menu is available on February 14 and costs $85 per person. Reservations may be made by calling (832) 942-5080. Loved it all, I can’t wait to return to Texas so I can eat and drink at these fine restaurants. As for Jared’s their nice, but… Just pass me the wine. Thank you..